ECC Day 3: Why are we here? Why are we here? This isn’t intended to be a grand philosophical question, but some days you have to ask yourself why you’re doing what you’re doing. Some days everything seems to be against you. Today was one of those days. 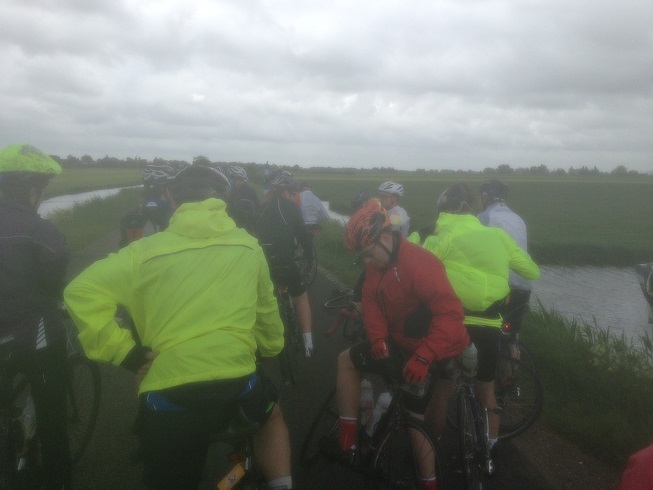 The Day 3 route promised to be long; the longest of the Euro City Cycle. It was further than many of the participants (including myself) had done before. As well as being long, the route was complicated, circuitous and fiddly. It required navigation through the backstreets of towns and travel across several bodies of water by various means. As it happened, the weather also conspired to make the day even more challenging. It had been suggested that it would be wet throughout; wet and windy… joy! So it was with some trepidation that we set out to make our way from Hoofddorp to Breda. Time to cover up… here comes the rain (again)! Each participant has their own unique reasons for participating in the challenge. As we battled against the elements, driving rain and near gale force winds, it would not have been unreasonable for some of us to question why we’re here. It wouldn’t have been a surprise is some of the group decided that catching a lift in the support van was a sensible move. Every time we crossed open ground the elements seemed to re-double their efforts to make the day difficult, to make us miserable. We slowly made our way along the route, back-tracking on many occasions as our guide grappled with the finer points of navigation. Ferry crossings required patience, breaking any rhythm we may have built. Even the railway crossings seemed to conspire against us, waiting for us to approach before flashing warning signs and bringing us to a halt. In particular, the Moerdijk Bridge tested our resolve: The bridge spanned about 700m of open water. It was positioned perfectly to expose us to the worst the day could muster including gusts of wind of over 55 km/hr. The wind carried rain that was being propelled with almost enough force to draw blood. Each crossing was long and dangerous as we leant into the wind at a precarious angle, trying to adjust for every gust and lull. It was really windy, painful and more than a little bit scary! Relief at reaching the other side! Despite the challenges, everybody made it. 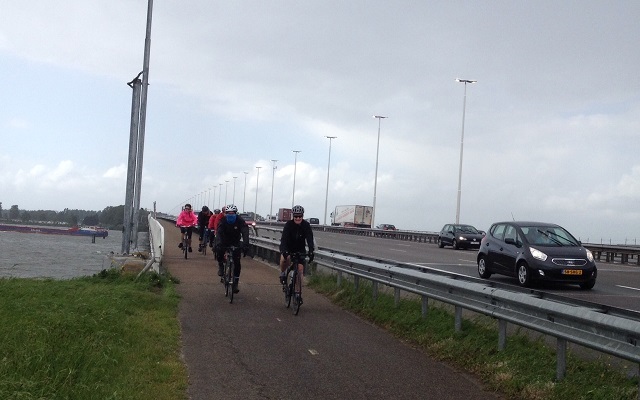 Everyone made it across the bridge, and everyone made it safely to Breda. I didn’t hear anyone suggesting that they had had enough, they couldn’t do it or that they were going to pack it in. There was relief at reaching Breda. There was a real sense of accomplishment (despite the route being slightly shorter than advertised). Individually and collectively we overcame the challenges the day could throw at us. Together we had made it! Somewhere, over the rainbow… almost there! It turned out that everyone’s answer to the question “Why are we here?” was enough to get them through. For me it is because I can be, because of all the hours I’ve spent on the Turbo Trainer over the winter to get myself in shape, because there is life after a Heart Attack, because I’m lucky, I’m alive. Not doing it isn’t an option. Tomorrow promises to be another challenging day. I am confident that it will be another successful and rewarding one. Bring it on! 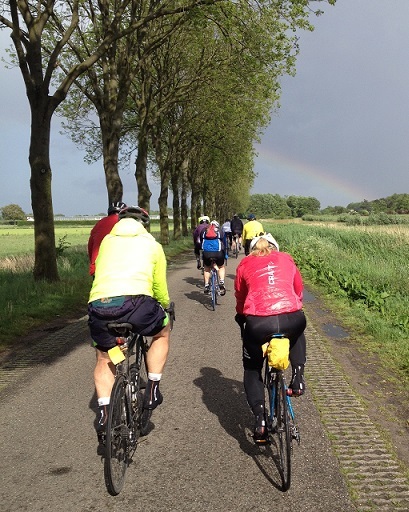 This entry was posted in Charity Bike Ride and tagged Cardiac Rehabilitation, Cycling in the Netherlands, Euro City Cycle, Moerdijk Bridge on May 10, 2014 by Paul Squire. Don’t think you’d bargained on strong wind and torrential rain! Nice easy, albeit long cycle into Europe I thought! No pain no gain though! Well done to all the group for overcoming the elements! The elements certainly added the “challenge” to the challenge as far as I’m concerned. Still, amazing what you can put up with when you put your mind to it!